From surfski.info, kindly provided by Rob Mousley. 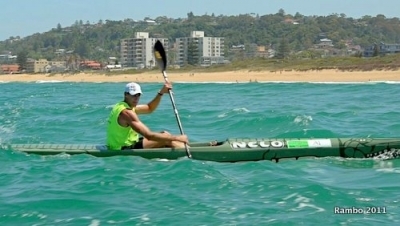 NOT even three-time world ironman champion Shannon Eckstein could stop Tim Jacobs on Saturday in the Vajda Narrabeen Downwind Challenge. Shannon’s brother, five-time Coolangatta Gold winner Caine Eckstein, couldn’t either. But the most excited person on the beach was Jacobs’ proud mum, Jenny. “I am so happy for Tim, he works so hard,” she said as he crossed the line in 1hr 13min 22sec. “He loves taking part in the Ocean Series, and is very proud of his (undefeated) record this season. “It was great to see Shannon and Caine taking part, it lifts the quality of the race. Next on the agenda for Jacobs is the Steelcase Dragon Run in Hong Kong on Saturday. “I know the competition is going to be fierce but I don’t mind that one bit, it brings the best out of me. Jacobs was on the water this morning with Nelo boss Andre Santos and South African Sean Rice. Conditions were perfect for the Dragon Run course… A brisk 15-20kt NNE. The forecast for Saturday though is not ideal at present: the Hong Kong Observatory is predicting “South force 3, becoming north force 5.” It’s already started raining and it’s expected to continue through Saturday with heavy falls on Saturday morning! and bouyweather.com says that it’s going to be flat; winds light and variable… curses!